Home / Front Page/ Foreign remittance on your mobile! Foreign remittance on your mobile! Dialog Axiata Plc in association with Etisalat and Hutch yesterday rolled out a secure and convenient service of receiving foreign remittances direct to the mobile wallet – eZ Cash in partnership with global specialist HomeSend in a joint industry effort to enhance formal sector transactions. Overseas remittances at $ 7 billion is the biggest foreign exchange earner but a considerable amount still comes via informal channels outside the banking sector. 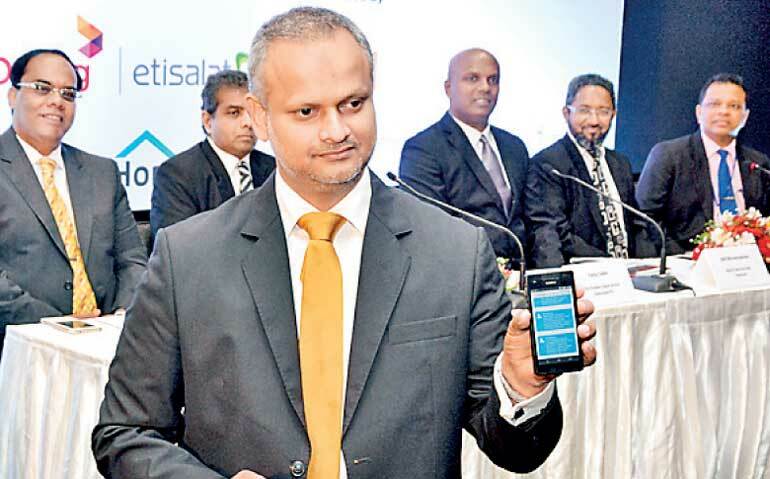 The concerted effort by three mobile operators makes the service available to 14 million subscribers and further enhances the value addition by eZ Cash, the world’s first inter-mobile operable mobile payment system with over 16,000 agent locations in Sri Lanka. The tie-up with Belgium-based HomeSend, which is a joint venture by MasterCard, eServGlobal and BICS, enables cross border and cross-network transfer. The service currently allows transactions up to Rs. 25,000 or around $ 180 and Dialog officials are having discussions with Central Bank to increase the transfer value up to Rs. 50,000. eZ Cash services also include utility payments, institutional payments and domestic money transfer facilities. Commenting on why why consumers would prefer eZ Cash over reputed traditional banking channels that are well geared to serve the remittance sector, HNB Managing Director/CEO Jonathan Alles stated that it all boiled down to a lot of volume and small value remittances that come from the Middle East. He added that sometimes the cost itself was prohibitive in relation to the transaction when banks originally started doing these remittances, which pushed away the potential customer. Informal channelling to transact was first originated in the Indian market and then it eventually spread out. Alles stated that methods such as eZ Cash, which pushes money to mobiles and ATMs, would push more remittances to the formal system which would subsequently help to track the informal remittances apart from the reported values known to the public. He further said that in doing so it would help financial organisations to do more with such customers. “Unfortunately, because there is no track record of them, it’s very difficult for banks to serve their customers in a more efficient way,” he noted.